Known for: A long laundry list of animation achievements. 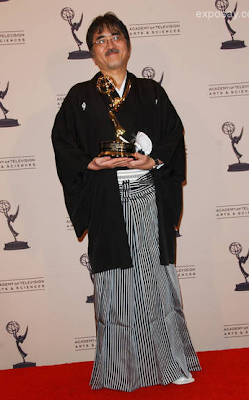 New and notable, however, is the juried Emmy Award for Outstanding Individual Achievement in Animation that Ikeda received on Saturday, for his work on Afro Samurai. The Emmy is a monumental first for a Japanese-animated production, and when Ikeda took to the mic, he humbly apologized for his minimal English and delivered thank yous in his native tongue–to a roomful of resounding applause. Congratulasians go out to Ikeda! And mad props for also dressing super sharp!